The ‘Children, Not Soldiers’ campaign, launched at a special event held in New York, calls on Governments, regional and non-governmental organizations to work with the UN to intensify efforts to meet the goal of zero use of children by any Government forces by 2016. He added that progress in this campaign will help to fuel further success in reaching the many non-State actors that also continue to recruit children. Parties to conflict that recruit and use children are listed in the annexes of the Secretary-General’s Annual Report on Children and Armed Conflict. Ten years ago, the Security Council called on all these parties to work with the UN and prepare time-bound action plans to end and prevent the recruitment and use of children. Through this mechanism, the Council opened the door for governments to affirm their commitment that children do not belong in their security forces and to receive the assistance needed to transform this commitment into reality. Currently, eight Government security forces are listed for the recruitment and use of children. In the past three years, six of those countries have signed action plans with the UN: Afghanistan, Chad, South Sudan, Myanmar, Somalia and the Democratic Republic of the Congo. Both Yemen and Sudan have expressed their commitment to child-free security forces, and dialogue with the UN is ongoing. Over the next two years, the Office of the Special Representative, the UN Children’s Fund (UNICEF), and UN and non-governmental organization partners will redouble their support to the eight Governments’ efforts to release and reintegrate children into civilian life and fully implement action plans to end and prevent recruitment. “The recruitment and use of children by armed forces must end,” said UNICEF Executive Director Anthony Lake, adding that ‘Children, Not Soldiers’ can give this issue more of the focus and attention it deserves. “When we help a former child soldier overcome such a terrible experience and prepare for a new future, we do more than mend a broken life. We begin to bind the wounds of a nation torn by conflict,” he stated. The launch of the campaign was hosted by Jean Asselborn, Minister for Foreign and European Affairs of Luxembourg, which in January 2013 assumed the presidency of the Security Council Working Group on Children and Armed Conflict for a two-year mandate. “By having to take part in hostilities, by being compelled to become instruments of war, the most fundamental rights of children are violated: their right to life, to health, to education, to protection from physical or mental violence,” said Mr. Asselborn. 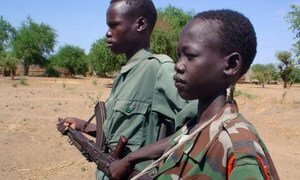 More than 6,000 child soldiers may now be involved in the conflict in the Central African Republic (CAR), with their numbers growing as fighting pits community against community in clashes that have taken on increasingly sectarian overtones, the United Nations reported today.